Here at NewsFour, we’ve previously covered efforts to solve urban environmental problems that communities can tackle on the ground level. There have been issues surrounding the disposal, or lack thereof, of dog mess. One company has teamed up with Sandymount residents to raise awareness of this problem with full advantage to the local environment. The company is Greensax. NewsFour spoke with Russell Walsh, co-founder and general manager, about their recent collaboration with the Sandymount community. June 23rd saw the announcement of the winner of a schools poster competition to promote the responsible use of Greensax products. Greensax are biodegradable refuse bags which can be used to convert recyclable waste into useable bio-material. 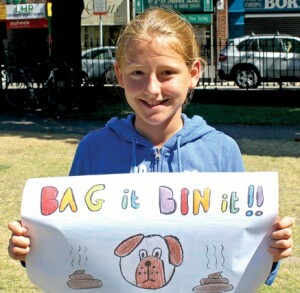 The poster contest, named Bag It, Bin It, took place across the three National Schools based in Sandymount. Greensax gave a presentation at each of the schools, on the subject of littering, with an emphasis on dog fouling and personal responsibility. Entries were divided in both cases into Junior and Senior categories, for the sake of fairness. Winners could be awarded 1st, 2nd or 3rd place and would win book vouchers from Sandymount’s own Books on the Green. The overall winner, whose poster will be displayed in businesses in the area, was Sarah Forbes of St Matthew’s National School. Each school also received a supply of the bags and a half-ton or so of compost made from food and garden waste. Above: Overall winner Sarah Forbes with her winning design for a poster.